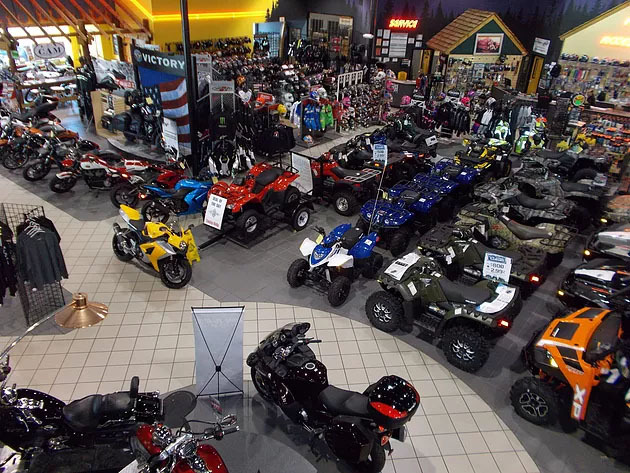 A family-oriented business centered around their community, Extreme Powersports is located in Columbus, GA offering Honda, Yamaha, Kawasaki, Suzuki, Polaris, Can-Am and Victory. Focused on providing unparalleled service, they pledge their best efforts to make the customer experience both beneficial and enjoyable. Paul McGowen, GM of Extreme Powersports, attended our Spring Marketing Boot Camp this March. The Boot Camp is focused on creating a road map for dealers to implement an online and offline marketing plan that leads to predictable growth for dealerships. After taking a hard look at his marketing plan, he decided to shift his focus from more traditional media to more direct response marketing. 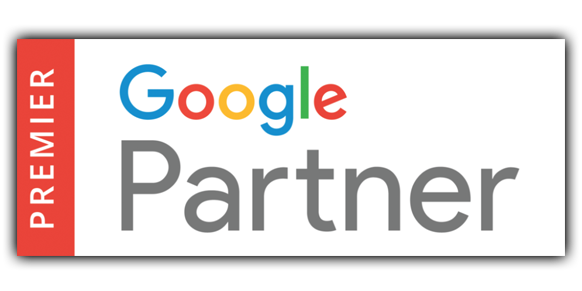 Through our two marque products, the Local Web Dominator Program & the Sharp Shooter Program, we help dealers implement a SYSTEM for Predictable Growth by increasing the number of customers spending money with the dealership annually and the average amount of money they spend. 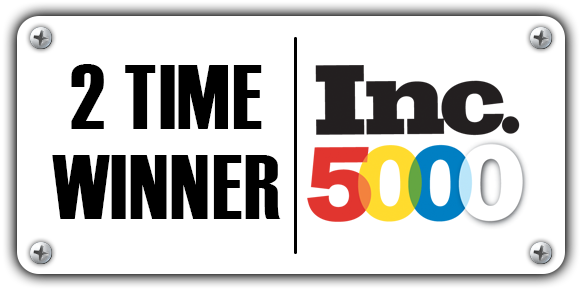 Paul wanted to be laser-focused on 3,500 past customers so that he could reactivate customers who hadn’t spent money with him in the previous year and increase frequency of visits of his existing customers to increase the amount they spend in 2017. To ensure the 3,500 customers receive the message, we target them with up to 12 direct marketing strategies. By giving customers more opportunities to respond to the marketing, we increase the amount of traffic on event day and the number of leads being generated. Bigger picture, we’ve learned that the more you touch your customer base, the more responsive they become and over the course of the year, more of them walk through the dealership’s doors more often and the business grows. The message we utilize is focused on inviting customers to a party. These events don’t need to be a Kiss Concert, but as long as the dealership has a few things that are most important to the customer like food, drinks, door prizes and demo rides, they’ll never get tired of being invited and they’ll show up at your dealership more times throughout the course of the year. And since they’re basically kids in a candy store when they’re at your dealership, they literally won’t be able to stop themselves from buying more apparel, accessories, servicing their ride more (because they’re riding it more often) and ultimately shorten the time between their major unit purchases. Executing on all four pillars of the Sharp Shooter Program - Right Audience, Right Media, Right Message & Right Timing, really paid off. 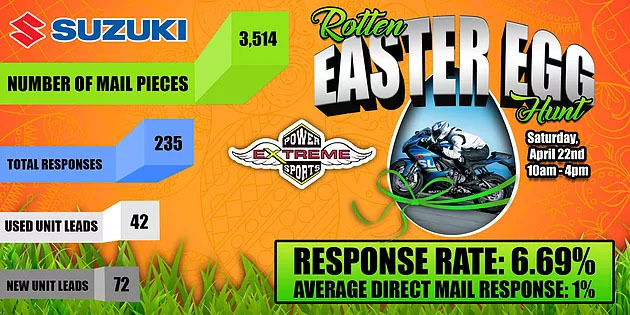 For their Rotten Easter Egg Hunt, the program generated 235 completed surveys including 133 sales opportunities in Clothing, P&A and Service, PLUS 114 responses for a new or used unit! The number of leads being generated is increasing significantly from the consistency in his marketing. After his third event of the year, he’s been able to more than double the amount of leads being generated per campaign from 102 – 235! After the event, Paul told his Account Executive, Josh Rapplean, that the traffic and event went great! He added that he was most excited to get to work on the bike leads and see how many more units he’ll be able to roll over the next couple months. Paul already has his Armed Forces Day Event planned for May 20th to keep the momentum going. June means the kickoff to Summer, Father’s Day and the ramp up to 4th of July. It’s time to make hay while the sun’s shining! Check out our website for some killer campaign options for June and for more information on how the Sharp Shooter Program can help you achieve your marketing goals in 2017, call me on my direct line 877-242-4472 ext: 112. Happy selling.